A young donkey is weak and small, and no one is able to ride him. His owner gets frustrated at his uselessness, and ties him up on the edge of town. Then two men arrive and untie him, bringing him with them away from town. Worried and scared, he follows reluctantly. The donkey has no idea that he has been chosen for a mighty purpose, and that Jesus intends to heal him first. Filled with renewed energy from the miracle he has received, the donkey proudly carries Jesus into Jerusalem. 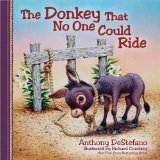 The Donkey That No One Could Ride is a dramatized fictional tale told in rhyming verse from the donkey’s perspective. Kids will recall the events of Palm Sunday as they cheer for this poor outcast donkey. This book would make a great addition to any child’s Easter book collection.